In order to deal with all the anxiety that comes with creating, you must acknowledge and accept that anxiety is part of the process, demand of yourself that you will learn -- and really practice! -- some anxiety management skills, and get on with your creating and your anxiety management. Here are some excellent everyday anxiety management tools. You can choose to be made anxious by every new opinion you hear or you can choose to keep your own counsel. You can choose to approach life anxiously or you can choose to approach it calmly. It is a matter of flipping an internal switch -- one that you control. Incorrectly appraising situations as more important, more dangerous or more negative than they in fact are raises your anxiety level. You can significantly reduce your experience of anxiety by refusing to appraise situations as catastrophically negative. Your lifestyle supports calmness or it doesn't. When you rush less, create fewer unnecessary pressures and stressors, get sufficient rest and exercise, eat a healthy diet, take time to relax, include love and friendship, and live in balance, then you reduce your experience of anxiety. How much harder will it be to deal with the creative anxiety in your life if your very lifestyle is producing its own magnum of anxiety? What you actually do when you feel anxious makes a big difference. If a ten-minute shower or a twenty-minute walk can do as good a job of reducing your anxiety as watching another hour of televised golf or smoking several cigarettes, isn't it the behavior to choose? There are many time-wasting, unhealthy, and dispiriting ways to manage anxiety -- and many efficient, healthy, and uplifting ways, too. The simplest anxiety management technique is deep breathing. By stopping to deeply breathe (5 seconds on the inhale, 5 seconds on the exhale) you stop your racing mind and alert your body to the fact that you want to be calmer. Begin to incorporate deep breaths into your daily routine, especially at those times when you think about and turn to your creative projects. Changing the way you think is probably the most useful and powerful anti-anxiety strategy. You can do this straightforwardly by 1) noticing what you are saying to yourself; 2) disputing the self-talk that makes you anxious or does not serve you; and 3) substituting more affirmative, positive or useful self-talk. This three-step process really works if you will practice it and commit to it. A variation on the last two strategies is to use them together and to "drop" a useful cognition into a deep breath, thinking "half" the thought as you inhale and "half" the thought as you exhale. Incantations that can reduce your experience of anxiety include "I am perfectly calm" or "I trust my resources." Experiment with some short phrases that, when dropped into a deep breath, help you quell your anxious feelings. Physical relaxation techniques include such simple procedures as rubbing your shoulder and such elaborate procedures as "progressive relaxation techniques" where you slowly relax each part of your body in turn. Doing something physically soothing can prove really useful in the moment to help you calm yourself and when used in combination with your cognitive practice. Meditation and other mindfulness practices that help you take charge of your thoughts and get a grip on your mind can prove very useful as part of your anxiety management program. The better a job you do of releasing those thoughts and replacing them with more affirmative ones, the less you will experience anxiety. Guided imagery is a technique where you guide yourself to calmness by mentally picturing a calming image or a series of images. You might picture yourself on a blanket by the beach, walking by a lake, or swinging on a porch swing. Determine what images calm you by trying out various images and then actually bring them to mind when you are feeling anxious. "Disidentification" is the core idea of the branch of psychotherapy known as psychosynthesis. Rather than attaching too much significance to a passing thought, feeling, worry, or doubt, you remind yourself that you are larger than and different from all the stray, temporal events that seem so important in the moment. For example, you stop saying "I'm anxious" and begin to say, "I'm having a passing feeling of anxiety." By making these linguistic changes you fundamentally reduce your experience of anxiety. Creating and using a ceremony or ritual is a simple but powerful way to reduce your experience of anxiety. For many people lowering the lights, lighting candles, putting on soothing music and in other ways ceremonially creating a calming environment helps significantly. Learn to ceremonially move from the rush of everyday life to the quiet of your creative work, whether that work may be. If your mind starts to focus on some anxiety-producing thought or situation or if you feel yourself becoming too wary, watchful and vigilant, one thing you can do is to consciously turn your attention in another direction and reorient yourself away from your anxious thoughts and toward a more neutral stimulus. Anxiety and stress build up in the body and techniques that vent that stress can prove very useful. For example, one discharge technique that actors learn to employ to reduce their experience of anxiety before a performance is to "silently scream" -- to make the facial gestures and whole body intentions that go with uttering a good cleansing scream without actually uttering any sound. If you intend to create, whether it's building a home business, writing a novel, or experiencing everyday life more deeply, get ready for anxiety. It is coming! You can handle it beautifully if you use the simple tools I've just described and turn yourself into an anxiety management expert. *Based on the book Mastering Creative Anxiety C 2011 by Eric Maisel. Printed with permission of New World Library, Novato, CA. All rights reserved. To order Managing Creative Anxiety from Amazon.com, click here! An Interview with author Eric Maisel, Ph.D.
Eric Maisel, Ph.D., is America's foremost creativity coach and is widely known as the creativity expert. 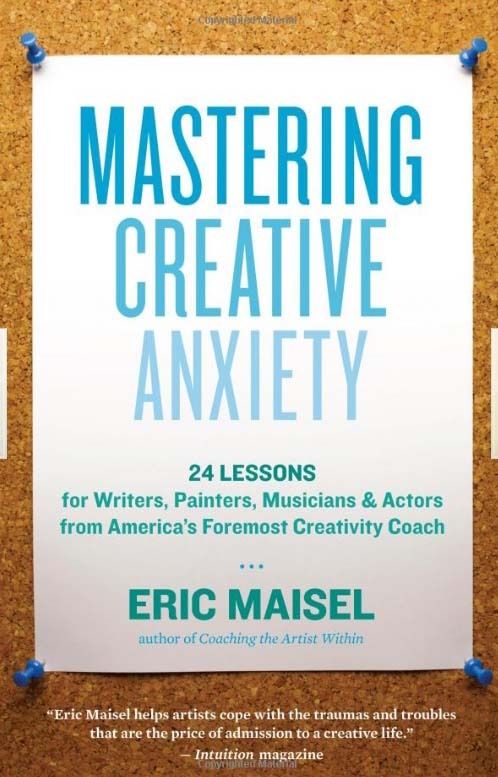 Eric Maisel, PhD, is the author of Mastering Creative Anxiety and numerous other titles including Brainstorm, Creativity for Life, Coaching the Artist Within, and A Writer's San Francico. America's foremost creativity coach, he is widely known as a creativity expert who coaches individuals and trains creativity coaches through workshops and keynotes nationally and internationally. He has blogs on the Huffington Post and WholeLiving.com and writes columns for ArtBistro and Art Calendar Magazine. Visit him online at http://www.ericmaisel.com. You've written many books for creative people. What's your intention with this book? I'm continually surprised by how much anxiety the creative process generates and by how much difficulty creative people have dealing with the many anxieties connected both to the creative process and the creative life. I've written on these matters before but in this book I identify the many different anxieties that can arise -- whether it's about going into the unknown, lacking self-confidence, experiencing a crisis of meaning, and so on -- and present a useful arsenal of anxiety management tools from which creative people can select. I think it's the most in-depth look at these issues to appear so far. First of all, so much is on the line. For someone who's self-identified as a writer, painter, composer, scientist, inventor, and so on, his identity and ego are wrapped up in how well he creates -- and when what we do matters that much, we naturally get anxious. It's one thing to sing in the shower and another thing to agree to sing at your daughter's wedding: so much more feels on the line! Second, the process demands that we don't know until we know: it is a voyage into the darkness of an unknown place where our plot or image or melody resides. People want to know right now, even before they begin: they want a kind of guarantee that they will succeed based on already knowing the outcome. But this guarantee just isn't available -- which produces anxiety. There are many other reasons, too -- enough to make anyone sweat! It's quite idiosyncratic, though certain situations are notorious for producing anxiety. For most performers, waiting in the wings is much more trying than actually going on. Some painters find the blank canvas intimidating while other painters feel more anxious as they try to decide when and if their painting is actually complete. One writer is made tremendously anxious by plotting while another gets into a panic at the thought of talking with her literary agent. It is quite idiosyncratic but the general rule is, the more important you consider the situation, the more anxiety you'll experience. That big audition, that television interview in front of millions, that conversation with the last editor likely to want your book -- the bigger you perceive the moment, the more anxiety gets generated. There are really a great many, from taking charge of your basic attitude and becoming a calmer person to doing a better job of appraising situations so that they don't seem so dangerous to using time-honored devices like good luck charms. In Mastering Creative Anxiety I present a menu of twenty-two effective anxiety management tools, enough tools that everyone can find at least one or two that will work well. The simplest is to remember to breathe; a few deep cleansing breaths can do wonders for reducing anxiety. The most important anxiety management tool is probably cognitive work, where you change the things you say to yourself, turning anxious thoughts into calmer, more productive thoughts. And creating a lifestyle that supports calmness is also very important: if the way you live your life produces a lot of anxiety, that's a tremendous extra burden on your nervous system. You say that "getting a grip on your mind" is a key anxiety-management strategy. Can you tell us how we can get a better grip? Changing the way you think is probably the most useful and powerful anxiety management strategy. You can do this straightforwardly by 1) noticing what you are saying to yourself; 2) disputing the self-talk that makes you anxious or that does not serve you; and 3) substituting more affirmative, positive or useful self-talk. This three-step process really works if you will practice it and commit to it -- it's the way a person gets a grip on his mind. You focus a lot on "making meaning" as part of the creative process. How are "making meaning" and anxiety related? The biggest challenge facing a creative person is keeping the belief firmly in place that what she is attempting matters to her. A creative person's main challenge is therefore existential: we easily lose the sense that what we are doing matters, given how many novels or paintings there are in the world, how hard it is to do the work well, how difficult the marketplace feels, and all the rest. Two kinds of anxiety arise with respect to this profound existential issue: the anxiety that arises when we begin to sense that our work doesn't matter to us and the anxiety that arises when we realize that our work matters very much to us (and what a burden all that mattering puts on our shoulders!). When you decide to make meaning these two anxieties confront you: the anxiety that arises when you wonder if you just fooling yourself about your work's importance and the anxiety that arises because your work does matter to you and you want to do it well. What's the number one thing that a creative person needs to remember with respect to creative anxiety? That it will take real work to deal with it. None of the techniques in the book will be available to you when you need them simply because you read about them and nod your head. You have to practice them and use them. It is not enough to agree that your self-talk is unhelpful and unfriendly. You must notice what you're saying to yourself, dispute those utterances that don't serve you, and actively substitute more affirmative, useful language. It isn't enough to like the idea of guided imagery or to agree that stress reduction makes sense. You must practice your chosen visualization and your chosen stress reduction techniques. If you want the results, you will have to do the work. Given that anxiety is an inevitable part of the creative process, isn't creating a roller-coaster ride of emotions?